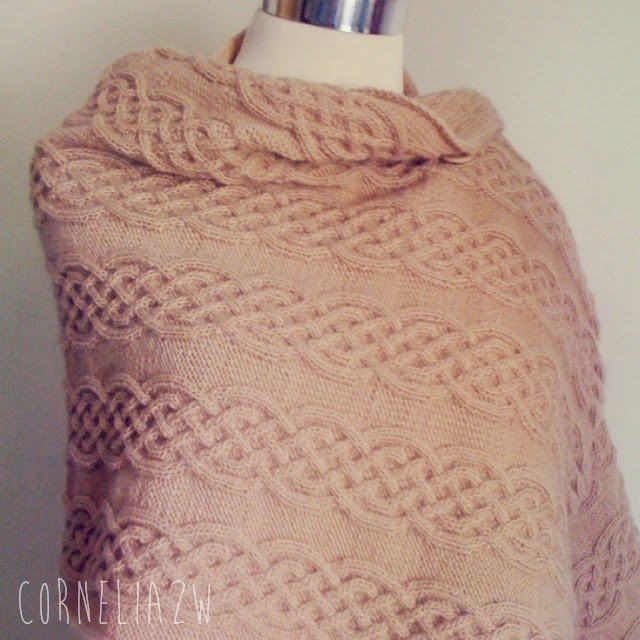 I would like to share the shawl pattern that modified by me. Actually it's just simple modification. 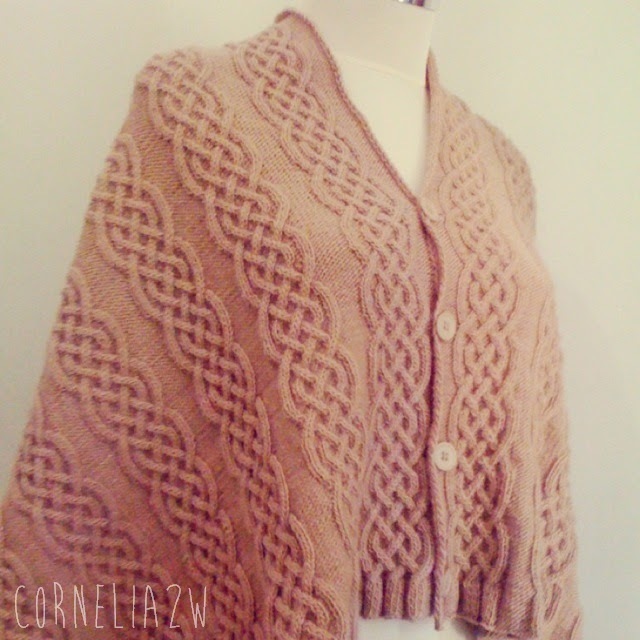 Just make celtic cable at all over shawl. 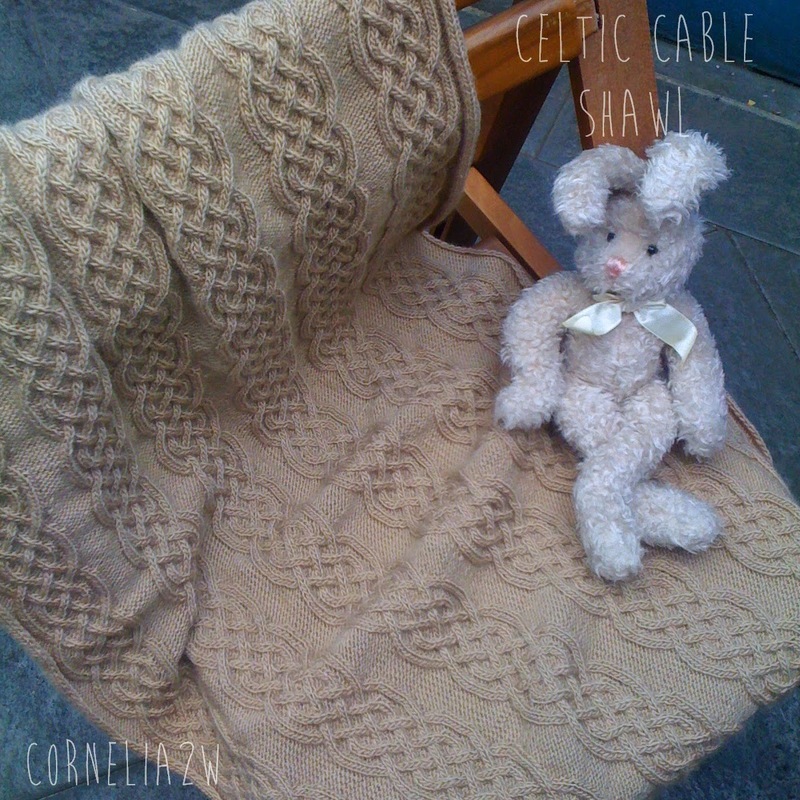 But sorry because it's about the copyright, then I could not write the Celtic cable pattern from the book The Knitter's Bible by Claire Crompton. Fortunately I found another pattern at Knitting Bee and it's free. You can find in here. Row 1, 3, 5, 7 : (P6, K4, P4, K4, P4, K4) 6 times, P6. Row 2 and every foll WS row : K all K sts and P all P sts. Start to make Celtic Cable. Row 9 : [ P6, ( C4b, P4 ) 2 times, C4b, P2 ] 6 times, P4. Row 11 : [ P5, Cr3R, (Cr4L, Cr4R ) 2 times, Cr3L, P1 ] 6 times, P4. Row 13 : [ P4, Cr3R, P1, ( P2, C4F, P2 ) 2 times, P1, Cr3L ] 6 times, P4. Row 15 : [ P4, K2, P2, ( Cr4R, Cr4L ) 2 times, P2, K2 ] 6 times, P4. Row 17 : [ P4, ( K2, P2 ) 2 times, P2, C4B, P2, ( P2, K2 ) 2 times ] 6 times, P4. Row 19 : [ P4, K2, P2, ( Cr4L, Cr4R ) 2 times, P2, K2 ] 6 times, P4. Row 21 : [ P4, Cr3L, P1, ( P2, C4F, P2 ) 2 times, P1, Cr3R ] 6 times, P4. Row 23 : P4, [ P1, Cr3L, (Cr4R, Cr4L) 2 times, Cr3R, P5 ] 6 times. Row 24 : K4, [ ( K2, P4, K2 ) 3 times, K4 ] 6 times. Repeat Row 9 - Row 24 as long as you want. Repeat Row 1 - Row 8. Cr3L : slip 2 sts on cn at front of work, P1, K2 from cn. Cr3R : slip 1 st on cn at back of work, K2, P1 from cn. Cr4L : slip 2 sts on cn at front of work, P2, K2 from cn. Cr4R : slip 2 sts on cn at back of work, K2, P2 from cn. C4F : slip 2 sts on cn at front of work, K2, K2 from cn. C4B : slip 2 sts on cn at back of work, K2, K2 from cn.